There is further progress on the traffic and parking schemes under consideration for the Ward to report following the meeting of the South Sutton, Cheam and Belmont Local Committee held on 8 September 2016 and the discussion at the Environment and Neighbourhoods Committee on 15 September of a global strategy for parking. To ensure a consistent approach throughout the Borough, all local schemes will be drawn into a central strategy and progressed on the basis of an assessment of priorities. An ambitious scheme for the introduction of a 20mph scheme across most of the area of Sutton South Ward west of the Sutton to Belmont railway line has now been included in the “Local Implementation Plan” prepared by Transport for London. This was the subject of proposals put to the local committee in 2015. However, it is on the “reserve list” which means that implementation in the near future is most unlikely. A parking scheme for the newly-named Berridge Close is agreed, implementation to coincide with the opening of the adjacent Subsea7 building, as this will lead to more intensive use of the road by those working in the building and accessing the underground car park. Obstructive parking in Berridge Close could lead to problems when the building is occupied, so needs to be avoided. It is proposed that the road will be included in the controlled parking zone with four parking bays in the road, reserved for residents with parking permits. Completion of the building is unlikely before December. Traffic and parking schemes were the subject of a session at the December 2015 meeting of the South Sutton, Cheam and Belmont Local Committee, when residents noted down parking and traffic problems. A list of the proposals raised by residents was reported back to the local committee meeting on 10 March. In relation to our own area, the proposals fell into three main categories. First, concerns about intensive and sometimes obstructive parking in Mayfield Road and roads nearby (The Ridgway, Chalgrove Road, Upland Road). Second, concerns about visibility at the Farm Road / The Ridgway junction. Third, a set of other concerns, mostly about speeding at various locations. This listing will form the agenda for further work by the traffic department within a wider cross-Borough study, which is centrally managed by the Council. A number of minor, initial proposals were agreed on 10 March, including to restrict parking at the Prior Avenue / Banstead Road junction due to visibility issues. The question of a parking control scheme in Mayfield Road and the surrounding area was the subject of a consultation exercise by local Councillors last year which showed support in Mayfield Road but not adjacent roads. On 10 March the local committee agreed to devote some of its public realm funds to fund the traffic department to “kick start” a study of potential for parking controls in this area. A discussion between traffic engineers and Ward Councillors to consider this study was held on 8 June in Mayfield Road. The traffic engineers will design a parking control scheme for consultation. The precise parameters of this scheme and the consultation have yet to be finalised. Consultation with residents is due to begin in January 2017. Some residents of Audley Place have commented to us that there is difficulty when driving out of Audley Place in seeing vehicles coming down Camborne Road, if cars are parked close to the corner. We raised this issue with traffic engineers and the Council is proposing a small extension of the yellow lines on each side at the exit from Audley Place. We think this will do the trick in terms of making it easier, and safer, to drive out into Camborne Road. Residents of Tapestry Close have complained to us about obstructive parking in the Close. We raised this issue with traffic engineers and a scheme of yellow lining was proposed. Further consultation with residents, required by law, found some residents objecting and this scheme is currently on hold. 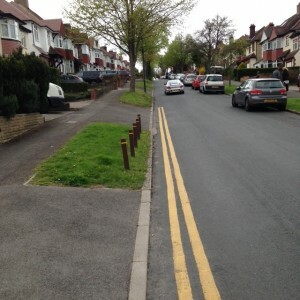 Several schemes consulted on some time ago have now been implemented, including yellow lining at the bottom of Downside Road to deal with obstructive parking (see photo above) and switching some “pay and display” bays to “dual use” so residents with parking permits can use them, in Grange Road and Langley Park Road. I have seen your news on parking in Mayfield Road and Ridgeway. What about Chalgrove Road? There is no mention and the situation has deteriorated since that survey was carried out. Now residents, some without their own drives, have difficulty in parking in our road. Surely you are not going to look at all the other roads without including Chalgrove?